As world leaders descended on Copenhagen to engage in fierce debate over how to combat global warming last December, few would have predicted the planet was about to experience its harshest winter for decades. Temperatures plummeted across the Northern Hemisphere and blizzards battered cities across China, Europe and North America, bringing planes, trains and automobiles to a crippling standstill. On Jan 3, Beijing was blanketed by the heaviest snowfall in 60 years, while three days later Hamburg in Germany registered its coldest day since 1963. The extreme weather conditions have prompted many climate -change skeptics to speak out about the "much politicized" theories over global warming, with some scientists even speculating that the Earth could be on the cusp of a "mini ice age". Public confidence in the purported threat of global warming was also shaken last month when a serious error was discovered in a Nobel Prize-winning document on climate change. The Intergovernmental Panel on Climate Change (IPCC) has been forced to apologize for mistakes made in a 2007 report that stated the Himalayan glaciers would likely melt by 2035. Media reports showed the prediction was copied from a 2005 document entitled Overview of Glaciers, Glacier Retreat, and Subsequent Impacts in Nepal, India and China published by WWF, the international action group, which in turn lifted the information from an article in the New Scientist magazine. The IPCC later admitted the information was not peer reviewed, which basically means verified by other scientists. The scandal followed quickly on the heels of "climategate" in December, when several leading British scientists were exposed for publishing only data that supported the widely propagated theory that the planet is experiencing global warming due to man-made carbon emissions. E-mails leaked to the press showed the scientists were covering up problems in key temperature studies on which their work was based. Calls for an honest, transparent and international debate on the climate is growing stronger. Despite the IPCC's controversial fourth assessment report concluding that warming of the climate system is "unequivocal", Xie Zhenhua, China's top climate change negotiator, said the country is keeping an "open attitude" about global warming when he addressed a Jan 24 forum for BASIC countries - Brazil, South Africa, India and China. Statistics cited in the IPCC report showed the global average temperature has risen about 0.8 C since 1850, when nations began burning coal to power industrialization. More than 50 percent of this increase is "very likely" - more than a 90-percent possibility - the result of man-made "greenhouse gas emissions", the report said. Greenhouse gases, including water vapor, carbon dioxide (CO2), methane and nitrous oxide, trap heat in the atmosphere and send it downwards to the ground, effectively helping to regulate the temperature of the planet. It is a natural process and essential for life on Earth, say scientists. Human activities, such as burning fossil fuels, have massively increased the concentration of CO2 in the atmosphere from 280 parts per million during the pre-industrial era to today's 387 ppm, showed IPCC studies. 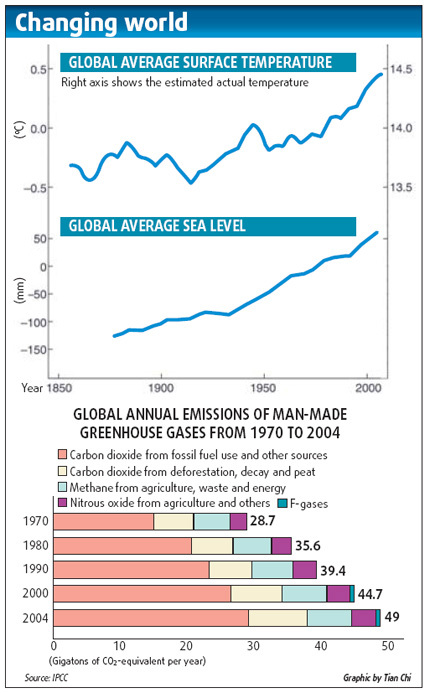 Based on such findings, the panel predicted in its 2007 report that global temperatures would soar 1.4 C by the end of the century to 5.8 C.
Chinese experts, however, have cast doubt on the link between CO2 concentration levels and the global temperature rise over the past 150 years, which has been the basis of arguments over carbon emissions reduction plans in recent years. Ge Quansheng, vice-director of geographic sciences and natural resources research for the Chinese Academy of Sciences, said he believes the IPCC may have exaggerated the impact of human activities because of the incomplete collection of climate data. "The IPCC report offered no definite scientific basis for the sensitivity of climate change to atmospheric CO2 concentration, although a warming trend was witnessed in the latter half of the 20th century," Ge wrote in a report published on Jan 15. Many questions were not answered in the IPCC's fourth assessment report, he wrote, such as how much does the natural cycle contribute to the global warming? And are man-made aerosols countering or worsening the temperature rise? Norden E. Huang, director of the research center for adaptive data analysis at the National Central University in Taiwan, agreed that the IPCC was wrong to maintain the theory that CO2 levels are the controlling force in climate change, and said the world's oceans play a much larger role in global warming. Studies on air bubbles found in Antarctic ice core samples have enabled scientists to chart variations in the planet's temperature and greenhouse gases over the past 800,000 years, he explained. "Looking at the available ice core data, there is an almost perfect correlation between the temperature and CO2," he said. "But the change in temperature has always preceded any increase in the atmospheric concentration of CO2, so it is too arbitrary to conclude that most of the historical global warming was caused by changes in the levels of CO2." 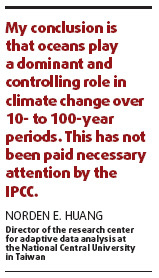 The rate of warming also remains a contentious problem, said Huang, who has provided a different interpretation for the same data used for the 2007 IPCC report. In 1998, as chief scientist for oceanography at the NASA Goddard Space Flight Center in the United States, Huang developed an adaptive method of analyzing non-linear and non-stationary systems inspired by ocean waves. "The world is non-linear, so any data analysis method with pre-defined base functions will never produce reasonable results for 'trends' such as climate change or the stock market," he said. The method received eight patents in US and was honored by NASA as one of the most important applied mathematics inventions in recent history. Using his method, and by separating possible natural climate cycles from the recorded changes in temperature, Huang said he found the rate of global warming is only half the alarming rate predicted in the IPCC report. "My conclusion is that oceans play a dominant and controlling role in climate change over 10- to 100-year periods. This has not been paid necessary attention by the IPCC," he said. Global temperatures during the past millennium can be broken down into four cycles - 194 years, 116 years, 62 years and 21 years - and these show why the Earth has become warmer in recent decades, according to Qian Weihong, a professor of atmospheric science at Peking University and a renowned climate change skeptic. The accelerated warming rate over the last 20 years is due to the combination of the four cycles, he said. Based on this belief, global temperatures could begin to fall from 2010 until 2030, when the natural climate cycles move into a downward curve. Other scientists are also studying the impact of black carbon aerosols on the atmosphere. Aerosols are tiny articles suspended in the air that occur naturally from volcanoes, forests, sea spray and vegetation, and during dust storms and grassland fires. However, human activities also generate aerosols, including black carbon, which is the soot released when fuels like diesel, wood and coal are burned. Most aerosols reflect sunlight back into space, thereby reducing the amount of solar radiation that reaches the Earth's surface and having a direct cooling effect. Recent studies, however, have found that black carbon aerosols could be major contributors to global warming. Once in the atmosphere, black carbon absorbs sunlight and emits heat, but after falling to the ground it darkens snow and ice, which reduces their ability to reflect sunlight and accelerates melting. Research published last December by NASA and the Chinese Academy of Sciences suggested black carbon aerosols have contributed significantly to the melting of the Tibetan glaciers, which explained why temperatures at the Tibetan plateau - known as the "third pole" by Chinese - have risen twice as fast as the rest of the world over the last 30 years. Liu Hongbin, a senior researcher for the National Climate Center in Beijing, welcomed the debate on the causes of climate change. "It is meaningful for us to better understand the issue and take actions to adapt to change," he said. No one should embrace the IPCC's conclusions as "the truth", he said. "Science itself is not the truth but it offers the best approach to finally close in on the truth. The conclusions were all made based on the knowledge scientists had acquired by a certain point of time. They are far from perfect." The number of Chinese contributors to the IPCC's reports has increased steadily from nine on the first assessment to 28 on the fourth, but the participation of climate scientists from China is still very limited, said Liu. 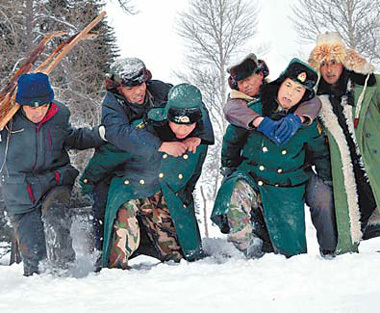 "The 28 Chinese scientists made up less than 2 percent of all contributors to the fourth assessment report," he said. One of the reasons is that climate data collected in China is not well received internationally. "The exposure of several plagiarism cases in the recent years has given Chinese scientists a bad reputation overseas. But it's unfair for the vast majority who work really hard," said Liu. 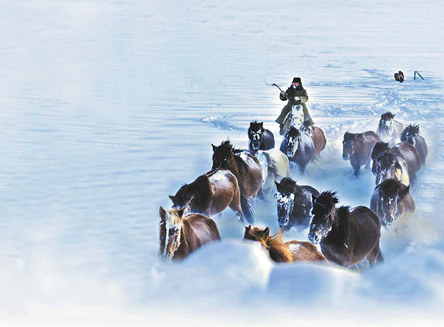 Most international scientists are concerned about the continuity of China's weather data. Most of the country's weather stations were only built after 1950, while most climate data collected before then was incomplete. But Liu insisted: "All available data from these weather stations is well verified and authentic. We are constantly improving data collection on climate change." Liu is now helping to recommend Chinese contributors for the IPCC's fifth assessment, which is due before 2014 and is expected to take into account more of the possible natural causes of global warming. Researchers will again be separated into three teams, with one group expected to address the physical science related to climate change, as well as look at aerosols, changes in sea levels and the carbon cycle. The final report will also have specific chapters that discuss the overlapping and interrelating factors of global warming, added Liu. "The aim is to get a more comprehensive and deep understanding of the issues surrounding climate change," he said. Huang in Taiwan also warned of the danger of global warming becoming a diplomatic issue. "Climate change used to be a scientific problem. It was very much politicized at last year's United Nations conference in Copenhagen," he said. "Politicians sell certainty but we scientists live off doubt."